The President of the Ghana Boxing Authority, Peter Raymond Zwennes, says he will marshal his new team of executive to create a new paradigm-shift for Ghana boxing. Minutes after being sworn into office for a second four-year term together with his lieutenants Saka Acquaye, the deputy director-general of the National Sports Authority, Zwennes promised Ghana boxing would witness a historic revival. “There will be a new approach, a new way of doing things. “Ghana boxing will have a story to tell future generations,” he promised. At the one-day congress held last Wednesday at the Theodosia Okoh Hockey pitch in Accra, veteran boxing financier/ manager/ promoter Henry Manly Spain beat veteran Rabon Dodoo, by 18 votes to become the authority’s new first vice-president. 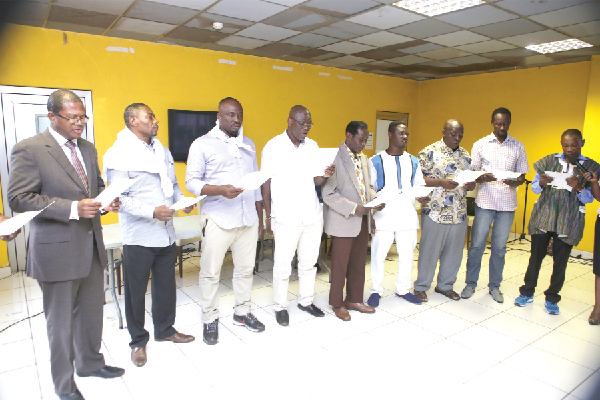 Four new executive members who were elected namely Alhaji Muritela Tofik, Isaac Quarcoo Acquaye, Alhaji Mushud Zeid and Lawrence Carl Loko were also sworn into office on the grand occasion attended by some former national and world champions. Earlier, the congress introduced a suggested green book of constitutional amendments which was accepted by all except one. Congress wavered on the age at which a boxer could turn professional and obtain a licence. Debate weighed age 16 versus age 18, to no end. In consequence, the issue was suspended for further deliberations at a later date. Congress also read and accepted the GBA’s constitution.